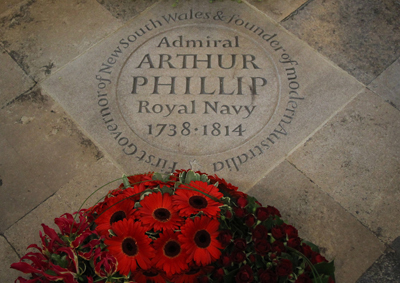 A memorial to Admiral Arthur Phillip, described as the “father of modern Australia”, was unveiled in Westminster Abbey back in July. Admiral Phillip (1738-1814) commanded the ‘First Fleet’ which left the UK in 1787, transporting convicts and military to the new colony Phillip founded as New South Wales. Prince Phillip, the Duke of Edinburgh, attended the memorial’s dedication service on 9th July which was conducted by the Dean of Westminster, Dr John Hall, who credited Admiral Phillip – a “modest, yet world-class seaman, linguist and patriot”- with laying the foundations “on which was developed the Commonwealth of Australia”. Among other dignitaries who attended was Dame Marie Bashir, the Governor of the Australian state of New South Wales, who described Admiral Phillip as “enlightened, far-sighted and indeed humane” and paid tribute to his attempts to actively foster harmonious relations with the Aboriginal people. Carved from Sydney sandstone, the memorial is set in the floor of the nave of the minster close to memorials of David Livingstone, Thomas Cochrane and Isaac Newton. The memorial stone is among a number of projects around Britain instigated by the Britain-Australia Society to mark the bicentenary year of Admiral Phillip’s death. For more on the abbey, see www.westminster-abbey.org. PICTURE: Andrew Dunsmore/Westminster Abbey.